Premature cardiovascular disease (CVD), including stroke, peripheral vascular disease, sudden death, coronary artery disease, and congestive heart failure, is a notorious problem in patients with chronic kidney disease (CKD). Because the presence of CVD is independently associated with kidney function decline, it appears that the relationship between CKD and CVD is reciprocal or bidirectional, and that it is this association that leads to the vicious circle contributing to premature death. As randomized, placebo-controlled trials have so far been disappointing and unable to show a survival benefit of various treatment strategies, such a lipid-lowering, increased dialysis dose and normalization of hemoglobin, the risk factor profile seems to be different in CKD compared with the general population. Indeed, seemingly paradoxical associations between traditional risk factors and cardiovascular outcome in patients with advanced CKD have complicated our efforts to identify the real cardiovascular culprits. This review focuses on the many new pieces that need to be fit into the complicated puzzle of uremic vascular disease, including persistent inflammation, endothelial dysfunction, oxidative stress, and vascular ossification. Each of these is not only highly prevalent in CKD but also more strongly linked to CVD in these patients than in the general population. However, a causal relationship between these new markers and CVD in CKD patients remains to be established. Finally, two novel disciplines, proteomics and epigenetics, will be discussed, because these tools may be helpful in the understanding of the discussed vascular risk factors. Compared with the general population, patients with chronic kidney disease (CKD) have an unacceptably high risk for premature death, primarily as a result of cardiovascular disease (CVD) (1). At the moment there seems to be little hope in sight for improvements because several large, randomized controlled trials have consistently shown no survival benefit from multiple new treatment strategies, such as increased dialysis dose (2,3), intensified nutrition (4), homocysteine-lowering therapy (5), normalization of hemoglobin with erythropoietin (6,7), lipid lowering with statins (8), and treatment with angiotensin-converting enzyme inhibitors (9). Thus, the risk factor profile in this unfortunate patient group seems to be markedly different from that of the general population. In fact, reduced renal function seems to change a state of healthy homeostasis to a state of allostasis, which is a chronic state of disordered homeostasis that allows survival of the organism only at the expense of well-being. A large number of population-based studies have demonstrated that even slightly reduced renal function, as well as even minor levels of albuminuria, can predict CVD and mortality. In a recent review of 85 publications, involving a total of 552,258 subjects, it was concluded that there is an undeniable link between kidney dysfunction and cardiovascular risk (10). Furthermore, the cardiovascular risk is increased very early on in the evolution of CKD (at a GFR of about 75 ml/min) and increases continuously with decrease in renal function (10). In accordance, recent reports have shown that patients with moderate to severe CKD are at a high risk of developing congestive heart failure (CHF) (11) and that the majority of these patients have coronary heart disease or risk equivalents (12). Because these associations are observed early during the evolution of CKD (13), the presence of even subtle kidney dysfunction is a condition that should result in intensive prevention of cardiovascular risk. Indeed, a Norwegian study of 65,604 people showed that although CKD patients at stage 2 to 3 have a low risk of progression to end-stage renal disease, they are at high risk of premature CVD death (14). As recent data shows that CVD is independently associated with kidney function decline (15), it could be concluded that the relationship between CKD and CVD is reciprocal or bidirectional and that this association leads to a vicious circle. However, the clear relation between slightly reduced GFR and cardiovascular risk may, at least partly, be the result of a relationship between reduced renal function and the total atherosclerotic burden because intrarenal atherosclerosis (ischemic renal disease) is a common cause of reduced renal function in patients with atherosclerosis (16). Because CKD may in this respect be a marker of the severity of existing atherosclerosis, a blood test for estimation of GFR and a test for albuminuria have been recommended for identification of CKD in screening and surveillance programs (17). With a more marked reduction in renal function, retention of uremic toxins and metabolic alterations are likely to contribute further to the high risk of CVD. These intriguing findings in the literature set the stage for this review on the puzzling links between a reduction of kidney function and an accelerated process of atherosclerosis. Many risk factors and metabolic alterations observed in the uremic milieu may contribute to the excessive risk of CVD in this population (Figure 1). 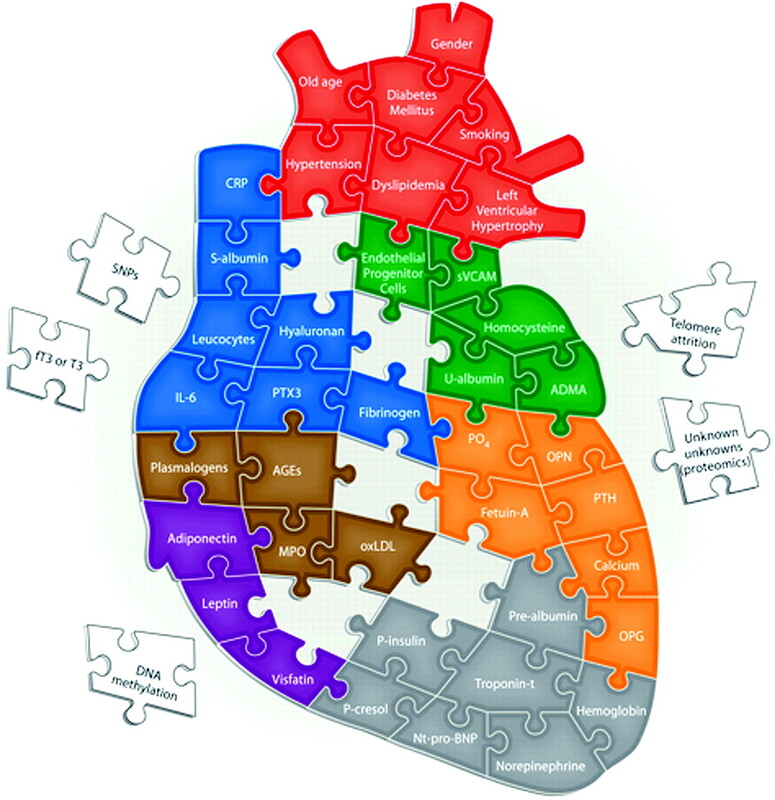 Figure 2 depicts pieces of the puzzle that have been demonstrated (or speculated) to be associated with CVD. Whereas traditional (i.e., Framingham) risk factors (age, lifestyle, left ventricular hypertrophy, dyslipidemia, hypertension, and diabetes mellitus) predict cardiovascular mortality in patients with mild to moderate CKD (18), so-called novel risk factors for CVD, such as inflammation, endothelial dysfunction, sympathetic overactivation, protein-energy wasting (i.e., the proposed new term for loss of body protein mass and fuel reserves (19)), oxidative stress, vascular calcification, and volume overload, are highly prevalent in these patients and seem to play a far more important role for vascular disease than in the general population (20–22). However, Wang et al. (23) recently demonstrated that the addition of multimarker scores (including markers of inflammation and volume overload) to conventional risk factors resulted only in small increases in the ability to grade risk in the general population. In accordance, Shlipak et al. (24) showed that, in elderly CKD patients, traditional cardiovascular risk factors had larger associations with cardiovascular mortality than novel risk factors. On the other hand, others have reported that, in advanced CKD, traditional risk factors for CVD seem to explain only partially the increased cardiovascular risk (20,25,26). When discussing the complicated interplay between traditional and novel risk factors in CKD it should be emphasized that risk factors seldom operate in separate rigid compartments; i.e., strong associations are usually found between traditional and novel risk factors. Schematic presentation of traditional and novel (or uremia-specific) cardiovascular risk factors in chronic kidney disease. The complicated puzzle of uremic CVD. Red puzzle pieces depict traditional (i.e., Framingham) risk factors thought to contribute to an excessive cardiovascular risk in CKD. The fact that many pieces in the puzzle are false (i.e., some pieces are risk markers and not etiological cardiovascular risk factors) renders the possibility to solve it more difficult. Blue puzzle pieces depict some inflammatory biomarkers that have been demonstrated to be associated with poor outcome in CKD. Green puzzle pieces depict some risk markers associated with endothelial dysfunction. Orange puzzle pieces depict risk markers associated with vascular ossification. Brown puzzle pieces depict surrogate markers of oxidative stress that have been associated with cardiovascular outcome in CKD. Purple puzzle pieces depict the emerging role of adipokines in uremic CVD. Gray puzzle pieces depict other risk markers associated with CVD in uremia, such as markers associated with volume overload, protein-energy wasting, and sympathetic overactivation. Finally, white puzzle pieces displayed outside the heart depict some emerging risk markers that may be associated with uremic CVD. CVD, cardiovascular disease; CKD, chronic kidney disease; CRP, C-reactive protein; sVCAM, soluble vascular cell adhesion molecule; SNP, single nucleotide polymorphism; T3, triiodothyronine; PTX3, pentraxin-3; ADMA, asymmetric dimethylarginine; AGEs, advanced glycation end products; OPN, osteopontin; PTH, parathyroid hormone; MPO, myeloperoxidase; oxLDL, oxidized LDL; OPG, osteoprotegerin; NT-pro-BNP, N-terminal pro-brain natriuretic peptide. The association between traditional risk factors and cardiovascular outcome in CKD is also complicated by the so-called reverse epidemiology phenomenon: i.e., the well-known association between established risk factors in the general population, such as hypertension, hypercholesterolemia, obesity, and hyperhomocysteinemia, does not exist, or even appears to be reversed, in patients with advanced CKD (27). One reason for this could be that different time profiles exist for different risk factors in different populations as premature deaths in CKD patients preclude the impact of complications, which are more important for long-term mortality. Furthermore, the common occurrence of persistent inflammation and/or protein-energy wasting in advanced CKD seems to a large extent to account for the seemingly paradoxical association between traditional risk factors and cardiovascular outcome in this patient group (28,29). Notably, this phenomenon is not limited to CKD patients but is also observed in other patient populations, including those with an advanced age, CHF, or malignancies (30). Although the amount of information available on early CKD is limited, preliminary studies suggest that the reverse epidemiology phenomenon is present also in CKD patients not yet on dialysis (31). How then could the impact of reverse epidemiology in CKD best be resolved? Mendelian randomization is a new approach based on the random distribution of gene polymorphisms that may allow epidemiologists to elucidate the possible confounding effects of environmental exposures in epidemiologic studies (32). For example, recent studies using this approach in the nonrenal population have demonstrated that C-reactive protein (CRP) may not play a causal role in the metabolic syndrome (33) or coronary ischemia (34). We believe that the inclusion of functional gene polymorphisms in renal epidemiologic studies may allow nephrologists to determine if risk factors such as CRP, S-cholesterol, and homocysteine are causal risk factors also in the context of uremia or if they are only markers of vascular disease. Indeed, as Zhang et al. (35) reported that there was no association between CRP haplotypes and cardiovascular outcome in dialysis patients, this study argues against CRP as a cardiovascular risk factor. On the other hand, because variations within the IL-6 gene were shown to affect the risk for CVD in a multiethnic dialysis cohort (36), this suggests that IL-6 should be the target for interventional studies. Elevated circulating levels of inflammatory markers, such as IL-6 (37), IL-18 (38), S-albumin (39), leukocytes (40), fibrinogen (41), hyaluronan (42), myeloperoxidase (43), CRP (44) and pentraxin-3 (PTX3) (45) have consistently been associated with cardiovascular morbidity and mortality in CKD. However, because not all inflammatory mediators found to be associated with poor prognosis in CKD also have a causal role in uremic vascular disease (i.e., some pieces in the puzzle are not relevant) solving the uremic puzzle is a complex task demanding innovation, serendipity, and stamina. Indeed, as a recent study in a mouse model with human-like hypercholesterolemia shows that human CRP is not proatherogenic but instead slows atherogenesis (46), the proatherogenic potential of CRP (and other inflammatory prognosticators) may need to be reevaluated. Homocysteine is another risk factor that has attracted much interest among nephrologists. Although there are multiple plausible mechanisms by which this sulfur-containing amino acid may promote endothelial dysfunction and vascular disease (47), clinical studies relating total plasma homocysteine to CVD have shown surprisingly conflicting results. In fact, recent studies show that low levels of homocysteine are paradoxically associated with poor outcome (29,47). Indeed, as hyperhomocysteinemia is observed in >90% of patients with advanced CKD, data suggest that homocysteine may not be as important as many other risk factors, such as inflammation, oxidative stress, and vascular calcification. Future studies should address whether other thiol metabolites retained in CKD, such as S-adenolsylhomocysteine (SAH) and S-adenolsylmethionine (SAM), better reflect the putative increased cardiovascular risk of retained sulfur amino acids in CKD. Another type of risk marker that has attracted interest among nephrologists as predictor of cardiovascular events in CKD is the volume-dependent cardiac biomarker. In dialysis patients, both N-terminal pro-brain natriuretic peptide (48) and troponin T (49) were independent predictors of both long-term mortality and cardiovascular death and events. In addition, surrogate markers of protein-energy wasting, such as S-albumin (39), S-creatinine (39), and prealbumin (50), consistently predict poor outcome in CKD. Other areas of interest in cardiovascular risk assessment include the role of increased sympathetic nervous system activity (51), glycemic control (52,53), insulin resistance (54), and anemia (55). Because adipose tissue has a physiological role far beyond the mere storage of energy (56), recent interest has focused on the role of adipokines, such as adiponectin (57), leptin (58), and visfatin (59), both as protectors and as promoters of vascular disease in CKD. As high body fat mass indicates well-preserved energy stores as well as high production of putatively proatherogenic adipokines, it is unclear why North American studies demonstrate a paradoxical survival advantage of obesity in advanced CKD (60). However, because obesity does not confer a survival advantage in North American CKD stage 3 to 4 patients (61) or European CKD stage 5 patients (62), obese patients starting dialysis in the United States may constitute a selected group of survivors (63). Recently, Scholze et al. (58) showed that low leptin levels predicted poor outcome in dialysis patients, which may just be another example of reverse epidemiology. Whereas earlier studies in dialysis patients showed that higher levels of adiponectin were associated with lower risk of cardiovascular events (57) and mortality (64), recent studies in larger cohorts surprisingly show that low rather than high adiponectin levels are associated with decreased mortality in both CHF (65) and CKD (66) patients. Clearly, as adiponectin may act in the brain to decrease body weight (67), the confounding effects of protein-energy wasting needs to be considered when studying the complex interactions between adiponectin and outcome. Moreover, as a recent study shows that the skeleton can act as an endocrine regulator of metabolism (68), studies are needed to link uremic bone disease to adipokine function and the uremic metabolic syndrome. Given the large number of traditional, uremia-specific and novel biomarkers (Table 1) that have been shown to be associated with increased cardiovascular risk and mortality in CKD, nephrologists do not yet know which risk factors should be used for screening in clinical practice. Because the role of cardiovascular risk markers have been the topic of extensive reviews in both the nonrenal (69) and renal (70) literature, we have chosen to limit this review to some, in our opinion, especially interesting risk factors in CKD patients: endothelial dysfunction, oxidative stress, vascular calcification, and subclinical hypothyroidism, as well as new areas of research aimed to use innovative tools (i.e., proteomic alterations and epigenetics). Endothelial dysfunction is a well-documented early phenomenon in atherosclerosis that precedes structural changes and clinical manifestations (71). Decreased endothelial function is thought to primarily reflect a decreased bioavailability of nitric oxide (NO), a critical endothelium-derived vasoactive factor with vasodilatory and antiatherosclerotic properties (72). Although endothelial dysfunction, usually assessed as flow-mediated vasodilation of the brachial artery, is progressively more common as renal function declines, the exact causes are not known (72). However, free plasma concentration of the protein-bound solute p-cresol has been demonstrated to be related to endothelial dysfunction in vitro (73–75) and to predict mortality in HD patients (76). Thus, detailed studies to examine the effects of various uremic toxins on endothelial dysfunction and cardiovascular outcome are needed. There is also growing evidence to support the hypothesis that asymmetric dimethylarginine (ADMA), an endogenous inhibitor of NO-synthase, is involved in mediating CVD (77). ADMA is primarily cleared by the kidney in vivo and is found in elevated circulating levels in CKD. ADMA is also an independent predictor of endothelial dysfunction (78) and poor outcome (79) in dialysis patients. However, Zoccali et al. (80) demonstrated that resolution of acute inflammation in CKD patients is associated with an increase in ADMA levels. Moreover, a study by Ravani et al. (81) demonstrated that ADMA represents a strong and independent risk marker for progression of CKD. Also, elevated ADMA levels in proteinuric patients with secondary amyloidosis correlate with endothelial function (82). Interestingly, improved endothelial function after administration of both soy proteins (83) and α-lipoic acid (84) in CKD patients have been linked to decreased ADMA levels. Albuminuria is a well-established predictor of increased cardiovascular risk (85). Because this risk seems to be independent of the risk associated with impaired kidney function, the pathogenetic mechanisms may be different (86). In fact, albuminuria is thought to be a much stronger predictor than a slightly reduced GFR of future decline of renal function (87). Because albuminuria is also associated with other cardiovascular risk factors, such as abnormalities in fibrinolysis (88), inflammation (89), and dyslipidemia (16), increased urinary albumin excretion may represent a glomerular reflection of a generalized increase in endothelial permeability (16,90). Although the nature of the links between albuminuria and increased vascular risk may partly be mediated through endothelial dysfunction, persistent low-grade inflammation also seems to play a role in this scenario. Indeed, inflammation is associated with both endothelial dysfunction (91) and albuminuria (89). In accordance, recent data from our group show strong associations between albuminuria, endothelial dysfunction and inflammation (Suliman et al., unpublished observations). In two different cohorts of renal patients (one with nephropathy caused by type-2 diabetes but normal renal function and one with advanced CKD), higher degree of albuminuria was strongly associated with increased levels of PTX3, an inflammatory mediator structurally linked to CRP and serum amyloid P. Interestingly, whereas the latter molecules are primarily produced in the liver in response to proinflammatory signals (92), PTX3 is produced by a variety of tissues and cells (mainly vascular endothelial cells and macrophages) in response to proinflammatory signals (93). Of interest also, fat tissue seems to be a significant source of PTX3 (94). PTX3 has been shown to be elevated in prevalent HD patients as compared with healthy individuals (95) and has been identified as a novel mortality risk factor in incident dialysis patients, independent of both traditional risk factors and CRP (45). This suggests that PTX3 may have an additional role in the atherogenic process to common inflammatory mediators, perhaps as a reflection (or promotor) of endothelial damage. Because of its extrahepatic synthesis, PTX3 levels are believed to be a true independent indicator of disease activity directly produced at sites of inflammation and intimately linked to endothelial dysfunction (96). The central role of the endothelium in the development of vascular disease has led to the search for novel and biologically relevant biochemical markers to estimate endothelial function and injury. Previous studies have shown that surrogate markers of endothelial dysfunction, such as adhesion molecules (intracellular adhesion molecule 1, vascular cell adhesion molecule 1, E-selectin), are strong and independent predictors of poor outcome in CKD (97,98). Even more interesting, detached circulating endothelial cells may serve as potential markers of endothelial damage in CKD (99). These circulating endothelial cells include endothelial progenitor cells (EPC), which are bone marrow–derived, and inflammatory endothelial cells, which are thought to be detached from the vessel walls and enter the circulation as a result of vascular injury. Normally, in response to ischemic insult and cytokine stimulation, EPC are mobilized from the bone marrow to act as repair cells in response to the endothelial injury. CKD represents a condition with impaired migratory activity (100) and/or decreased numbers (101,102) of circulating EPC, which may have a role in neovascularization of ischemic tissue and the progression of atherosclerosis and subsequent CVD (103). Indeed, low levels of EPC predicted the occurrence of cardiovascular events and death in coronary artery disease patients (104). An imbalance between the expression of circulating endothelial cells (reflecting inflammatory endothelial damage) and EPC (reflecting endothelial repair capacity) seems to exist in CKD (105,106). This imbalance may contribute to the pathogenesis and progression of the atherosclerosis process in CKD patients and may be linked to the ability of circulating inflammatory endothelial cells to interfere with the functional capacity for vessel wall repair by EPCs (107). However, a causal relationship between endothelial dysfunction and CVD in CKD patients remains to be established because drugs that were effective in improving endothelial dysfunction in CKD patients (108) did not show survival benefit. Until the results of new studies regarding this issue become available, endothelial dysfunction should be considered a cardiovascular marker and not an etiological factor in CKD patients. Finally, it should be noted that, in the uremic milieu, endothelial dysfunction is related to oxidative stress (109). Increased levels of oxidative stress markers are present in the plasma of CKD patients, which indicates that uremia is a prooxidant state (22). Indeed, the elevation of plasma F2-isoprostane concentration, which represents a stable index of lipid peroxidation in vivo (in particular F2-isoprostane α-III), has been demonstrated in CKD patients (110,111). The presence of oxidative modifications of proteins, which are also good oxidative stress plasma markers with remarkable stability compared with those of lipids, have also been demonstrated in CKD patients (112,113). The presence of numerous defects in the antioxidant defense system, which leads to a decrease in the clearance of reactive oxygen species, can be used as indirect oxidative markers. Increased oxidized to reduced plasma ratio of vitamin C and red blood cell glutathione has been demonstrated in dialysis patients (112). Oxidative stress seems to occur early in CKD evolution because oxidative markers have been documented in CKD stage 3 patients (111). Moreover, dialysis treatment seems ineffective in the correction of oxidative stress (114). However, several questions related to CKD oxidative stress remain largely unresolved. First, the relative importance of each type of oxidative stress in CKD patients is insufficiently evaluated. 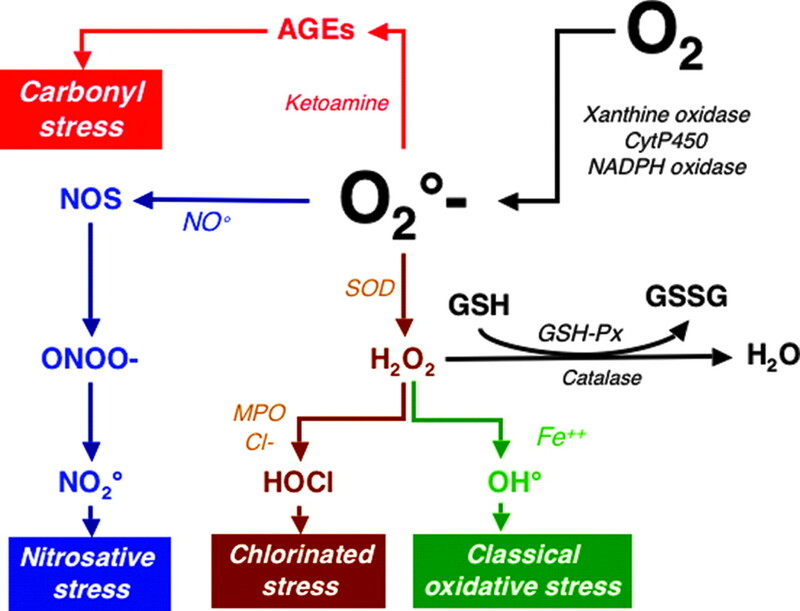 Conceptually, four pathways producing different types of oxidative stress can be hypothesized (Figure 3). To this date, only two studies have addressed which of the oxidative pathways in uremia is the most important, both studies suggesting that chlorinated, not nitrosative, stress plays a central role in these patients (115,116). Second, the prevalence of oxidative stress among CKD patients remains largely undetermined. Third, although priming of polymorphonuclear leukocytes is a prominent feature in CKD (117), the exact role of inflammation as a trigger of oxidative stress remains poorly defined. Longitudinal studies of patients with mild CKD are needed to resolve the issue of which is the initial culprit: inflammation or oxidative stress. Schematic presentation of oxidation and antioxidant pathways in chronic kidney disease. NADPH, nicotinamide-adenine dinucleotide phosphate; SOD, superoxide dismutase; NOS, nitric oxide synthase; CytP450, cytochromes P450; GSH, reduced glutathione; GSSG, oxidized glutathione; GSH-PX, glutathione peroxidase. The causal relationship between oxidative stress and CVD in CKD patients has not yet been firmly established. There are very limited data demonstrating the presence of oxidative markers in the atherosclerotic lesions of CKD patients, including hydrochlorus acid (HOCl)-modified lipoproteins (118) and advanced glycation end products (119). Of note, elevated circulating levels of surrogate markers of advanced glycation end products, such as pentosidine (120) and carboxymethyl-lysine (121), do not appear to be associated with poor outcome in CKD (perhaps as a consequence of reverse epidemiology). The few epidemiological studies available to evaluate the potential association between oxidative markers and CVD are so far inconclusive. Increased oxidative stress, as evaluated by the presence of high serum antibody-titer against oxidized low-density lipoproteins or by low vitamin E levels, was found to be associated with the degree of presence of carotid plaques and intima-media thickness, respectively, in CKD patients (122). In a cross-sectional study of HD patients, serum malondialdehyde was positively associated with prevalent CVD (123). However, in a different study, there was no significant correlation between lipid oxidation and endothelial dysfunction in CKD patients before or after the initiation of dialysis treatment (124). So far, only a few small, prospective, epidemiological studies that evaluate the association between surrogate markers of oxidative stress and CVD are available in CKD patients (43,125–127). This is in contrast to the larger number of prospective epidemiologic studies in the general population, which links low intake of dietary antioxidants to cardiovascular risk (128). Few data are available regarding the success of interventional trials with antioxidant treatment strategies aimed at reducing CVD in CKD patients. In one study, a reduction of cardiovascular events as an end point receiving oral vitamin E supplementation in CKD patients undergoing HD was demonstrated (129). In a second study, N-acetylcysteine, a thiol-containing antioxidant, was shown to reduce cardiovascular events in HD patients (130). However, these two clinical trials were small and of limited duration, and the effects of antioxidants on oxidative stress biomarkers were not well documented. Moreover, information related to the pharmacokinetic characteristics of antioxidants (131) as well as their efficacy to prevent oxidative stress are still limited in CKD. Because the administration of the antioxidant N-acetylcysteine led to a reduction of atheromatous lesion progression in an apolipoprotein E–knockout mouse model of CKD-enhanced atherosclerosis (132), this lends further support to a relationship between oxidative stress and CVD. Taken together, existing data suggest a prominent role of oxidative stress in this patient group and argue in favor of performing further studies of various antioxidative treatment strategies. Cardiovascular Ossification—Why Do CKD Patients Develop a Heart of Stone? Whereas vascular calcification (henceforth “ossification”) may sometimes be observed in the general population (133), CKD is a condition associated with a markedly more prevalent ossification of both the arterial intima and media (134). Indeed, studies indicate that large artery ossification (assessed using computer tomography or chest x-ray) is present in 30% to 70% of CKD patients (135,136) and in about 15% of pediatric CKD patients (137). Alarmingly, the presence of artery ossification is associated with functional estimates of arterial dysfunction, such as NO-dependent vasodilation in dialysis patients (138) and pulse-wave velocity (139), both of which have been associated with adverse outcome in CKD patients (140,141). Although, vascular ossification itself also is associated with increased risk of CVD in most (135,142,143) but not all (144) studies, there is still no definite proof that reducing vascular ossification improves outcome (145,146). Therefore, vascular ossification should currently be considered as a cardiovascular risk marker and not an etiological factor of CVD in CKD patients. With the increased understanding of the regulation of vascular wall ossification in CKD, multiple new biomarkers for early detection of arterial intima and/or media ossification have emerged. Serum levels of Ca and PO4 have become established risk markers through a number of observational (147,148) and interventional studies (146). An elevated parathyroid hormone level has also been suggested as a risk factor for and marker of vascular ossification as it likely partly reflects altered bone turn-over and Ca handling (148). Vitamin D deficiency, which is a common phenomenon in CKD, is also associated with increased early mortality (149). In the research setting, radiographic detection of arterial Ca through electron beam computer tomography (150) or cardiac ultrasound (143) appears to correlate with both observed CVD and outcome in this patient group. Also, a recent study shows that aortic arch calcification detected by chest x-ray can be a useful marker of vessel ossification that correlates well with electron beam computer tomography (139). Finally, low spine bone mineral density is associated with increased pulse-wave velocity in CKD stage 5, suggesting that it may reflect the close association between bone remodeling and extraosseous ossification (151). Molecular genetic techniques and in vitro models have revealed the necessity of inhibitory mechanisms to prevent ectopic calcification. Indeed, both clinical and experimental studies document that vascular calcification is an active and biologically regulated process that shares the characteristics of bone formation and bone repair (152). Thus, because vascular calcification may result as a result of imbalance of the equilibrium between promoters and inhibitors (153), the concentration of Ca and PO4 are surely not the only factors influencing ectopic ossification in CKD (154). To date, the best studied inhibitor of vascular ossification is α2-Heremans-Schmidt's glycoprotein, colloquially known as fetuin-A (after its mouse homolog). Fetuin-A is known to be the major carrier of Ca ions in the circulation, whereas mice lacking the gene encoding this protein rapidly develop ectopic soft-tissue ossification and die at an early age (154). In CKD stage 5, but not CKD stages 3 to 4 (155), low levels of circulating fetuin-A are associated with increased cardiovascular burden and mortality (156–158). Furthermore, mouse knockout experiments have been performed with the ossification regulators matrix-Gla protein, bone morphogenic proteins, osteopontin, and osteoprotegerin (OPG), all of which show an early and extensive vascular ossification phenotype (159). Increased serum levels of OPG (a glycoprotein that belongs to the TNF receptor superfamily) are found in CKD and associated with renal function (160). As levels of OPG were associated with rapid progression of both coronary artery calcification (161) and mortality (162) in dialysis patients, it has been suggested that OPG determination should be added to the biological follow-up of these patients (162). However, because increased levels of OPG are associated with increased cardiovascular risk, present findings seem to contradict the assumed protective properties of this ossification inhibitor. On the basis of these findings, it could be speculated that increased OPG levels in CKD may rather result from enhanced synthesis in the vessel walls by activated osteoblast-like cells. Although the roles of other ossification regulators in osteogenesis are well documented, their specific roles in the uremic vascular ossification process are less well defined. However, in a Japanese study, serum levels of osteopontin were significantly higher in dialysis patients compared with controls and were positively correlated with aortic calcification (163). During recent years a new concept has emerged based on the belief that low thyroid hormone levels in CKD patients could act as an intermediate link between the inflammatory stress and impaired cardiovascular response. CKD per se causes alterations in thyroid hormones in the absence of an underlying intrinsic thyroid disorder (164,165) characterized by a decrease in total (T3) and free (fT3) triiodothyronine concentration while thyroid-stimulating hormone levels are normal. Indeed, the so-called “low T3” condition is present in about one fourth of CKD patients (166). Traditionally, decreases in plasma T3 concentration have been interpreted as an attempt to conserve body energy stores by reducing metabolic rate (167). There are data indicating that a low T3 concentration is present in approximately 30% of CHF patients (168). Because low T3 levels are independent predictors of death in the general population (169,170), it has been suggested that decreased active thyroid hormone levels could be part of the deranged neuroendocrine/proinflammatory system that is associated with CHF (171). Thus, as low T3 levels may not just be an innocent bystander and could be involved in the increased mortality risk in this patient group, this could also be the case in CKD. Indeed, a low T3 level has recently been shown to be an independent predictor of all-cause mortality in prevalent HD (172) and peritoneal dialysis (173) patients as well as incident dialysis patients (174). Although the reasons for this observation are yet unknown, they may caused by the links between a state of subclinical hypothyroidism and low-grade persistent inflammation (175). Indeed, IL signaling has been reported to downregulate the peripheral conversion of total thyroxine into T3 in both experimental (176) and clinical (177) studies. It should be emphasized that in HD patients, inflammation was accompanied by reductions in T3 levels, reverting these to normal as inflammation resolved (175). Low T3 levels specifically predicted cardiovascular mortality in CKD patients (174), whereas they were associated with left ventricular hypertrophy in a peritoneal dialysis cohort (178). The recent observation that thyroid hormones enhance contractility and prevent pressure overload–induced cardiac dysfunction (179) might provide a mechanistic explanation on how low T3 levels could contribute to the development of CVD-related complications. However, we still need to understand the clinical and biochemical implications of these derangements. Longitudinal studies are needed to assess whether these cross-sectional observations reflect a causal relationship. Although the use of thyroid hormone therapy in nonthyroidal illnesses is controversial (180), interventional studies designed to reduce CVD in renal disease is a tempting idea. Of note, a recent 8-wk dietary intervention with low-protein diet in CKD patients decreased levels of proinflammatory cytokines with concomitant increases of both T3 and thyroxine (181). It remains to be shown whether various antiinflammatory strategies may correct low T3 levels and/or vice versa. Moreover, until further mechanistic studies have been performed, low T3 levels should be considered as a cardiovascular marker and not an etiological factor in CKD patients. Currently, only a small part of the pathophysiologically relevant mediators with significant vascular effects in the uremic milieu are known. Clearly, knowledge of these mediators is essential to better understand the mechanisms of cardiovascular lesions, and afterwards for the prevention and/or therapy of CVD. The analysis of proteins in body fluids (such as serum and urine) as well as dialysis fluid is now possible using proteomics (182,183). Thus, proteomics may be an emerging technological approach to identify and quantify relevant mediators of vascular disease (182). Proteomics can be utilized to integrate seemingly unrelated findings of different protein fragments into rational pathogenetic pathways (184,185). In one study, the authors assessed the potential of capillary electrophoresis (CE)–mass spectrometry (MS) and CE-MS/MS to identify uremic retention molecules within a mass range of 800 to 15,000 Da in dialysis fluids that were obtained with low-flux and high-flux membranes (182). Whereas CE-MS analysis detected 1394 polypeptides in spent dialysate samples that were obtained with high-flux membranes, only 1046 polypeptides were recovered in the dialysate from the same HD patients obtained using low-flux membranes. The same technology was used to identify polypeptides present in the plasma of dialysis patients that are generally absent in normal control subjects (183). This study revealed that >30 polypeptides show significant changes in the dialysis patients in comparison to controls with normal renal function. Two polypeptides could be identified: a fragment of fibrinogen alpha and a fragment of the complement factor peptide C3f. Of interest, the C3f fragment is produced by the proteolytic cleavage of C3b and might enhance vascular permeability. In accordance, C3f fragments have been found in the sera of patients with myocardial infarction but not in healthy controls (186). Although several polypeptides were affected/normalized by short-term oral vitamin C supplementation, the authors were not able to find any significant difference between classic oxidative/antioxidative stress and inflammation markers under vitamin C supplementation (187). Taken together, proteome analysis of plasma, urine, and dialysis fluid by proteomic analysis represents a sensitive and valuable new tool to pinpoint new molecular changes associated with uremia. A combination of data from the study of human plasma and dialysate fluid should identify multiple, previously unknown markers. Although it is clear that proteomics can make valuable contributions to clinical questions related to the CVD in CKD patients, the current challenge and long-term goal is to explore the most effective way in which proteomics can be integrated with current clinical laboratory markers to maximize their synergism for CVD detection. The impact of clinical proteomics will depend on the choice of samples, their technical qualities, transport, storage, and analysis, as well as clinical validation phases. Therefore, it remains imperative to validate the clinical utility of proteomic profiling using a large, blinded set of samples, and to establish comparability and standards for quality control before a significant use of proteomics can be advocated in CKD patients. Phenotypic variation is traditionally parsed into genetic and environmental components. Undoubtedly, variations within the genome may play an important role for the development of a specific phenotype in CKD (188,189). Recent evidence suggests that telomere shortening (attrition) is also associated with an inflammatory phenotype and increased mortality in CKD (190). In addition, environmental changes of the genome (i.e., epigenetics) may play an important role (191). The epigenome denotes properties of the genome that are not explained by the primary DNA sequence but rather by the results of modifications of DNA as a result of acetylation, ubiquitination, methylation, and phophorylation (Figure 4). Interestingly, epigenetics may also result in heritable changes in chromatin structure and DNA function without altering DNA sequence. Epigenetic tags not only differ between tissues and individuals but also with age as a result of disease and environmental interactions. 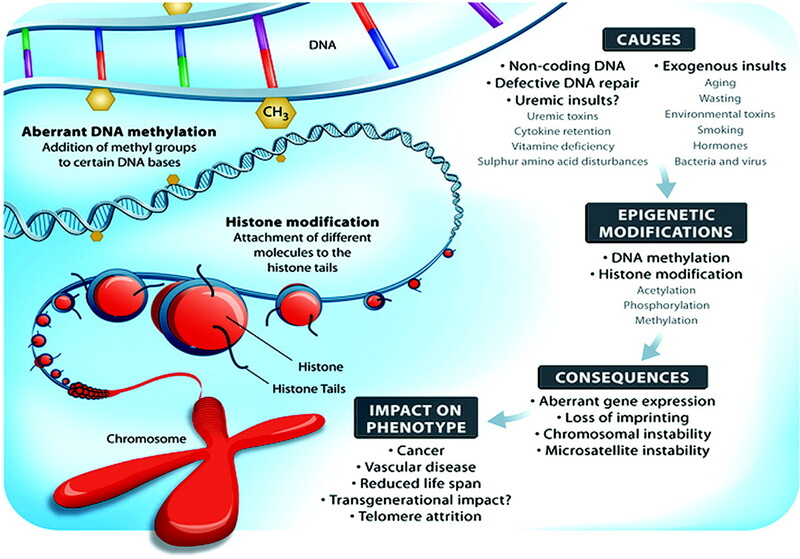 Schematic presentation of environmental causes of epigenetic modifications, including potential uremic insults, which may result in defective gene stability or expression. Emerging evidence suggests that aberrant (i.e., both hypo- and hypermethylation) DNA methylation (a leading mechanism for regulation of gene expression) is not only an important feature of cancer development and progression but also have a potential role in conditions like atherosclerosis and autoimmune diseases (192). DNA methylation changes occur during atherogenesis and may contribute to lesion development. Indeed, inactivation of the estrogen receptor alpha gene because of in vitro methylation has been demonstrated to play a role in atherogenesis and aging of the vascular system (193). By upregulation of atherosclerosis-susceptible genes and downregulation of atherosclerosis-protective genes, aberrant DNA methylation may contribute to accelerated atherosclerosis. As several features of uremia may contribute to aberrant DNA methylation epigenetic changes of DNA function and stability will be interesting to study in CKD. The homocysteine precursor S-adenosylmethionine is a competitive inhibitor of S-adenosylmethionine methyltransferases. Thus, because protein carboxyl methylation and repair is inhibited, this may lead to a state of unbalanced methylation in clinical states with hyperhomocysteinemia. In vascular disease patients increased homocysteine and S-adenosylmethionine concentrations were associated with DNA hypomethylation (194). In accordance, a selected group of 32 male hyperhomocysteinemic HD patients signs of DNA hypomethylation was found in peripheral mononuclear cells (195). As already discussed, the presence of inflammation may partly contribute to a counterintuitive association between low homocysteine levels and cardiovascular outcome in CKD (47). In this context it is interesting that inflammation may also cause aberrant DNA methylation (196). Hodge et al. (197) have demonstrated that the inflammatory cytokine IL-6 might exert an impact on epigenetic changes in cells via regulation of a DNA methyltransferase gene. In accordance, we demonstrated that global DNA hypermethylation was associated with inflammation and increased mortality in CKD (198). As we also find evidence of a relation between hyperhomocysteinemia and DNA hypomethylation, longitudinal studies are needed to resolve the complex interactions between aberrant DNA methylation, B vitamins, homocysteine, inflammation, and outcome in the context of uremia. As epigenetic DNA modifications are potentially reversible by interventions with, for example, folate in man (195) and genistein in mice (199), there is a possibility that future therapies directed at modifying the epigenome may have favorable effects on cardiovascular outcomes in CKD. Emerging evidence suggests that endothelial dysfunction, oxidative stress, vascular calcification, and inflammation are strongly interrelated and together play a major role in the initiation and progression of vascular disease in CKD. Because the observed associations between a specific uremic phenotype and genetic polymorphisms should not be affected by the reverse epidemiology phenomenon, the Mendelian randomization approach (i.e., finding the links between randomly distributed genotypes and the uremic phenotype) may be a valid method to pinpoint the real cardiovascular risk factors in CKD. We also propose that future research protocols, whenever possible, should use a global approach by studying whole pathogenetic pathways rather than associative studies linking a single risk factor to morbidity and mortality. Mechanistic experimental and interventional studies designed to test whether biomarkers are not only markers but also etiological risk factors may provide further information that could lead to novel treatment options. 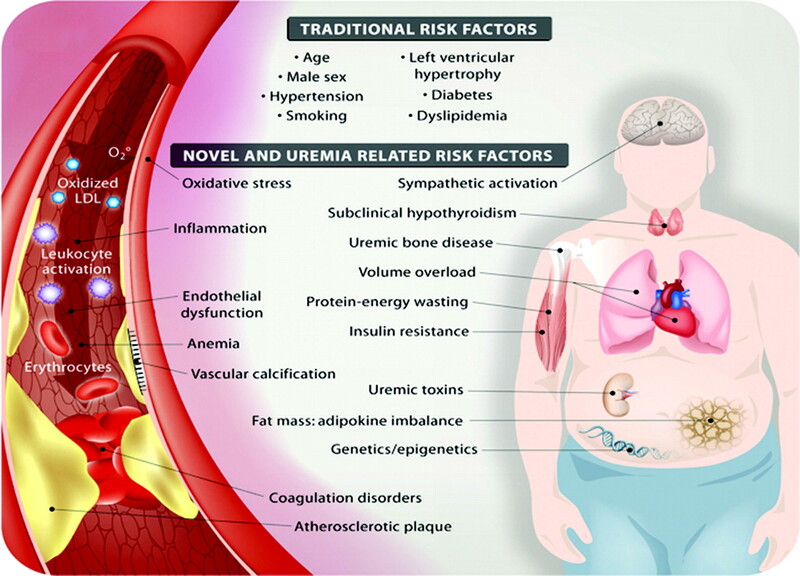 As traditional and novel risk factors are not likely to operate in separate rigid compartments, experimental studies identifying the impact of traditional risk factors, such as hypertension, diabetes, and obesity, on the atherogenic potential of novel risk factors in the uremic milieu are needed. Finally, new areas of research that aim to use innovative tools, such as proteomics and epigenetics, may be helpful in the identification of new vascular markers or factors, unravel existing pathogenetic pathways, and facilitate the more rapid development of novel, safe, and effective therapies. Peter Stenvinkel, Bengt Lindholm, and Ziad Massy are members of the European Uremic Toxin (EUTox) group. Bengt Lindholm is employed by Baxter. This work was supported by the Swedish National Research Foundation (P.S. ), National Heart and Lung Foundation (P.S. ), Westmans Foundation (P.S. ), Martin Rind (P.S.) and MEC (EX 2006–1670) (J.J.C.). You are going to email the following Emerging Biomarkers for Evaluating Cardiovascular Risk in the Chronic Kidney Disease Patient: How Do New Pieces Fit into the Uremic Puzzle?